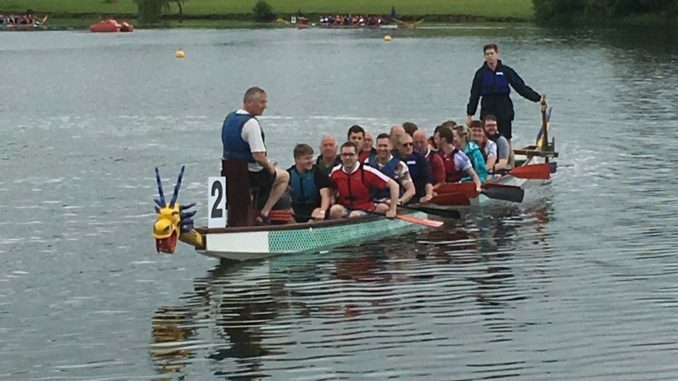 The Band entered the Rotary Dragon Boat Challenge at Pugneys, Wakefield for the 4th consecutive year, indeed, it is becoming a regular ‘fixture’ on the Band social calendar. 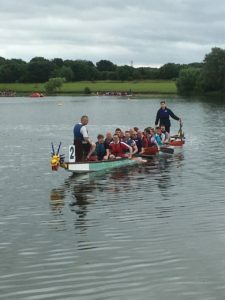 Each team of 16 paddlers, a drummer and a helmsman competes in three heats, over 250 metres, with the fastest six progressing to the final. Despite the atrocious weather conditions 30 teams attended and the band finished in a creditable 9th place, just half a second away from the final. The barbecue was on the go all day which must have been just the right ‘fuel’ for the paddlers as the times over the three heats improved in each race. The event, now in its eighth year, is organised by Huddersfield and Wakefield Chantry Rotary clubs and usually raises over £30,000 for good causes.